Don’t Forget About Your Heating Tune-Up! Tank or Tankless: Which Water Heater Is Right for Me? How Do Heat Pumps Heat and Cool? As mild as our winter weather may be here in Florida, the fact remains that we still need reliable heating systems installed in our homes if we hope to make it through the winter season comfortably. It does get chilly enough around here to necessitate the use of our heaters, even if it doesn’t do so all that frequently. In fact, this is exactly what makes the heat pump such a great option for homeowners in our area. If you are ready to install an HVAC system in a new property, or if you want to replace an existing system in your home, then it is definitely worth your while to look into using a heat pump in Tampa, FL. Heat pumps are unique and their benefits are considerable. Just remember that even the best heating and cooling systems are not really going to impress if you don’t schedule your HVAC services with qualified professionals. 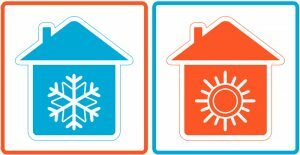 As mentioned in the title of this post, heat pumps are capable of both heating and cooling homes. This may sound too good to be true, but we’re not pulling your leg. When you use a heat pump in your home, you get year-round comfort with just one system. During the summer season, when you really need to cool your home down, the heat pump acts just like a central air conditioner. It evaporates refrigerant in the indoor coil, and that allows the refrigerant to remove heat from the air surrounding it. That refrigerant then travels out to the condenser unit outside. As it is condensed, its heat is released. Unlike a traditional central air conditioner, though, a heat pump is able to completely reverse this operation. A component called, appropriately enough, the reversing valve allows the refrigerant to move in the opposite direction. The function of the coils is flipped as well. Now, in its heating mode, the heat pump evaporates refrigerant in the outdoor coil, in order to remove heat from the air outside. That refrigerant is then compressed, which further boosts its thermal energy, and makes its way indoors. The indoor coil now functions as the condenser coil, and the refrigerant releases heat in the house in order to warm air for distribution throughout the living space. Like we said, winters are not particularly cold in this part of the country. That means that many people just don’t want to spend the money on an independent heating system. When you use a heat pump, you don’t have to. You also don’t need to worry about keeping a separate system in great working condition. Just remember that heat pumps require more frequent maintenance than traditional systems, as they are working year-round. Perhaps the greatest benefit of using a heat pump, though, is the fact that they heat so efficiently. We may not use our heaters too much, but everyone can appreciate an affordable heating performance when they do need it, right? Because heat pumps don’t generate new heat but instead transfer existing heat into the house, they are among the most efficient heaters available. Schedule your heat pump services with Bayonet Plumbing, Heating & Air Conditioning.